Since our chickens are not pets and not individually costly animals, we don't take them to the vet. For the price of a single visit, you could buy several chickens! But that means we have to do our own chicken doctoring when there is a problem. We want to keep them happy, healthy and productive so time is of the essence. If you notice something off (say, a chicken not going into the house at night or limping) investigate and act immediately. Recently we had a couple of chickens with one eye closed, but apparently well otherwise. We couldn't find much about it online. Sometimes an eye infection can be symptomatic of a serious neurological disease, but obviously not in our case. Most likely they got a foreign body into the eye during a particularly vigorous session of dust bathing (they really fling the dust and dirt about). So it was a question of catching the chicken in question, one of us holding it on its back while the other rinsed out the eye first (with eye drops or water from a syringe) and then applied an antibiotic eye ointment around it. The improvement was very rapid, leading to full recovery within a couple of days. We repeated the treatment once or twice until there was no discharge and the eye looked normal. Some hens (typically layers of very large eggs) are prone to this and we have one hen, Haze, who has been egg-bound three times. Pretty much every time she comes out of a moult. It's quite noticeable because she can't walk with that huge egg stuck in her. Once she fell over inside the hen house and another time she couldn't get into the hen house at night and just sat in the middle of the lawn. Each time we thought she was a goner. But we didn't give up. 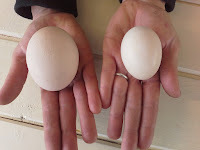 The hen needs to discharge her egg within 24 hours, otherwise it can be lethal. She needs to relax and have peace & quiet. Every time we gave Haze a warm bath in a big trug for about 15 or 20 minutes and she visibly relaxed. Then it was off to the 'hen spa', otherwise known as the chick hut, a little separate house with a small outdoor run. There Haze was provided with everything she needed, by way of food and water, plus a little hot mash for energy. After the egg was out and she was back to strength we popped her into the main hen house at night, to reunite her with the flock.